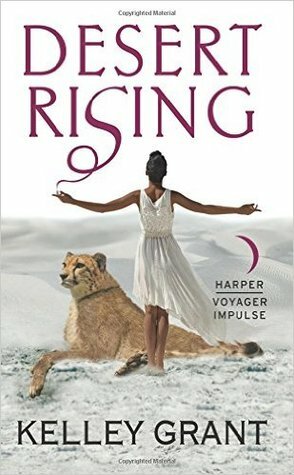 Desert Rising is on sale now for just $.99! Share with family & friends to get them hooked and ready for The Obsidian Temple. The newest version contains a teaser for The Obsidian Temple and I thought I'd give everyone a little taste! Just two more weeks! Endless dreams, Sulis thought, aimlessly stroking Djinn's head as the big cat lay upside down on her lap. That's what her life was made of now. Dreams of swords and pain and people she loved being murdered. Waking up and knowing that those dreams were true. Her grandmother told her to use the meditation she’d learned at the Temple to clear her mind, to banish the dreams. But when she closed her eyes, all she saw was the silver glint of a steel sword, cutting into Djinn, and then slicing Sulis open. Meditation was useless. Sulis would have preferred that the nightmares just go away. She would have preferred that she still feel called to something; like the urge she’d had after her mother’s death to go to Illian and pledge at the Temple. She was empty of that calling now. Now, eight years after she first felt the One’s summons, she felt nothing. The One had used her as a tool—a catalyst to upend the pledging system—and needed her no longer. Whatever had been inside her, whatever had driven her, was gone, and the space it had left was cavernous. She didn't know how to fill it, how to fill her life. Djinn reached a great paw up and touched her cheek to remind her she'd stopped stroking his head. She looked down at him, scratching behind his ears. He was still terribly thin, every rib showing under his tawny coat. His insides had been as torn as hers. Though the One had partially healed both of them, it had been a painful recovery. For Sulis, the pain had only become tolerable when Djinn had found his way back to her, after three moons of believing he was dead. She'd dreamed he was making his way to her in those months but hadn’t trusted herself to hope. Sulis frowned and glared up at her grandmother, whose tall, rangy form was silhouetted by the sun. “I wasn’t feeling sorry for myself,” she muttered. Sulis stared at her grandmother. She’d suspected for years that her grandmother could read people’s thoughts, but this was the first time her grandmother had confirmed it. The older lady smiled ironically and tipped her head to the side, telling Sulis she was on the right line of thought. “You worry too much about what has been when the future is upon us,” Grandmother said cryptically, and Sulis sighed, tired of puzzles. Sulis studied her grandmother, meeting her deep brown eyes. No one knew exactly how old Grandmother Hasifel was. Sulis wasn’t even certain of her first name—everyone just called her Grandmother Hasifel (or “your grandmother” if they were talking to the twins). Her spare, tall frame was still upright as a stick, but Sulis had seen Grandmother twist herself into impossible shapes while in moving meditation. Her skin was a burnished copper, her high cheekbones speckled with age spots and wrinkles. She radiated a restless energy, as though there was a raging river just barely contained under a thin layer of humanity. Her salt-and-pepper hair was oiled and pulled back in a tight bun now, but Sulis had seen it wild in an aura when Grandmother danced with the moon. Grandmother’s face morphed suddenly and became Sulis’s own. Sulis’s eyes widened as she stared into what seemed like her own reflection. As Sulis watched, that face wrinkled and became sad, with bitter lines about the mouth as though it grimaced often and rarely smiled. The mock Sulis’s eyes were dull, and her shoulders sagged. Her entire figure became hunched, her white hair was cropped close to her head and her motions furtive. Despairing, bitter, and angry, this older Sulis seemed to have found only disappointment and faded into obscurity. “Stop it,” Sulis ordered, her voice harsh, suddenly furious with her grandmother for showing her the terrible woman she would become. Djinn yowled once, sensing Sulis’s anger, and sat up beside her, his tail twitching. “Will become?” Her grandmother’s voice came out of the hunched figure. Suddenly the image was again Sulis, young as she was now. Sulis swallowed against the nausea the wavering form invoked. Which again began to change, this time surrounded by smile lines. The woman had a tall spine and radiated as much power as Grandmother, her limbs free and easy as white hair smoothed down her back. This elder Sulis was still wrinkled and wizened, but she looked like she laughed, like she ran, like she enjoyed life. This Sulis looked like she ruled. Djinn purred beside Sulis and settled back down, leaning against her. With that, her grandmother stood fluidly, her face her own once again. She nodded to someone behind Sulis and strode toward the village center without looking back. Sulis glanced behind her to see Ava standing in the shadows, one hand over her mouth, her blue eyes wide. A scarf over her blond hair protected the sensitive lighter skin of her neck and shoulders. Ava was a Northern Territory transplant, a girl of the Forsaken caste from the Temple city of Illian. She had been sent to Shpeth to heal after being kidnapped and abused in her home city. Her sister was Kadar’s lover, Farrah—who was the mother of his newborn daughter. Kadar had mentored the girl while he was at Shpeth, trying to make her comfortable in her new home. She’d been hovering around Sulis since Kadar left, but Sulis had made few attempts to befriend the young girl, not wanting to be responsible for yet another innocent life. Ava nodded and plunked down beside Sulis. She set a pouch down in front of her. Sulis cocked her head to one side, thinking about it. This was the most she’d heard Ava talk yet. “They fear her?” she asked curiously. Sulis smiled at Ava as the girl opened her pouch and removed a half-finished drawing of Djinn and some pencils. Ava had recovered well from the abuse by her captors less than a year ago, partially because of that intense attention from Sulis’s grandmother. Sulis suspected that her grandmother had blocked some of the worst memories from Ava’s mind, or perhaps just dimmed them so the girl could heal and be free to enjoy the last of her childhood. She knew that her Grandmother had somehow put the common desert tongue of Sanisk in Ava’s mind because she now spoke it as fluently as any desert dweller. Even so, Ava was more reserved than the other desert children, more mature in many ways. Sometimes she seemed lighthearted, playing with the other kids. But she also had dark, changeable moods, and Kadar had sadly told Sulis about the little happy chatterbox she used to be before the attacks. Ava now spent hours bent over a paper with pencil or ink. She expressed herself through her drawings, capturing her new life with incredible realism. They sat in comfortable silence a few minutes as Sulis watched Ava fill in her drawing, capturing Djinn’s essence with just a scrap of lead and paper. Sulis mulled over her grandmother’s words and what they meant to both of them. Grandmother had hinted that she had duties for Sulis, duties that Sulis had resisted while still trying to follow a past that was dead and gone. Ava scowled as Sulis got to her feet. “Not if you’re going to call her an old cat. I don’t want to be anywhere near the explosion that would cause.” She wiped her hands on her pants before grasping the hand Sulis held out to help her up. Djinn just rolled onto his side in the shade and heaved a big sigh. As they walked to the community center, Ava added, “And you’re not old, Sulis. You are pretty bony though.” A smile lit her fair face at Sulis’s growl. Illian. Kadar's heart sang with joy as they entered the southern gates of the city. He was returning to the woman he loved. He was meeting his little girl for the first time. Kadar frowned as the caravan stopped. He was also stuck in a slow crowd half a city away from both. “What is it?” Kadar called to his uncle Aaron, who had left the lead wagon in the assistant driver’s hands and was calming the restless mules. Kadar nodded, trying to hide his impatience. Uncle Aaron had warned him there was unrest in Illian. Minor skirmishes were occurring between the Forsaken caste and the soldiers of the deity Voras. This created delays through the city as soldiers closed off neighborhoods searching for the perpetrators, who seemed to melt into the shadows as quickly as they arose to pelt soldiers with rotting vegetables and dung. The city guard usually protected Illian, but they’d been overwhelmed with this level of unrest. Instead, Voras’s soldiers, who served the entire Northern Territory, were called in to quell the uprising and keep order. The delay was agony after the months of waiting to return to Illian. Kadar had spent the summer pacing the paths of his village in the desert, climbing the cliffs, worrying about his twin, Sulis. Though the One had brought her back from the brink of death after she’d been stabbed by the Voice of the deity Voras, Sulis’s wound had almost killed her. Kadar had fled Illian with Sulis, knowing that his beloved, Farrah, would bear their child without him by her side. The twin bond he and Sulis shared had kept her alive until Sulis’s feli, Djinn, had returned to her, and she’d truly begun to heal in body and mind. Kadar had waited impatiently as the days of summer cooled enough for caravans to travel through the desert once again, wanting to see the familiar colors of his family's banner on passing wagons. When Uncle Aaron finally returned with the autumn winds, he'd brought word of Farrah and Kadar's healthy little girl. Along with the good news, however, he brought word that Farrah's mother had been killed, trampled by soldier’s horses in the marketplace. Kadar had held Ava while she grieved and had wondered how Farrah was holding up under the strain of this death in addition to the care of their infant. The caravan moved forward again, and they turned the string toward the merchant district and the family’s sales hall. Kadar heard a shout and saw his cousin Simon wave once before pelting back in the direction of the hall to spread the news that the caravan had arrived. They were met at the hall by Simon and his younger brothers Kile and Abram, who began unloading the mules as Kadar toyed with his horse’s reins impatiently. “I sent Yanis to the house to let Da know you’re here,” Simon told them. “Thanks,” Kadar said. Turning his horse, he weaved his way through the traffic to the north side of town. As he approached his aunt and uncle’s house, a small crowd came out to greet him. He halted his horse and scanned the crowd for Farrah’s golden hair. He found the dark eyes of his aunt Raella, who shook her head slightly. Kadar swallowed his disappointment and dismounted. Farrah could not have known when in the day they would arrive. It was silly to be disappointed that she wasn’t waiting for him. He turned away from his horse, handing the reins to Yanis, and Aunt Raella stepped forward to greet him, a small, almost shy smile on her face. For the first time he noticed the bundle she was holding, swathed in linens. It moved, and he gazed at the little face, then back at his aunt. “Yes, she’s your daughter,” she said, laughing at his expression. Kadar gently pushed back the blanket around his daughter’s face. Her skin was a warm brown, lighter than his own skin and silky soft to his touch. She wiggled and opened her wide blue eyes. “Poor thing, she has my nose,” Kadar said softly, and startled when everyone laughed. For a few moments, he’d forgotten there was anyone but him and his daughter in the world. “I don’t know …” Kadar fumbled a bit with his hands, worried he’d drop the fragile baby. Aunt Raella positioned his hands under his daughter’s head and neck and under her body. She was light, tiny, and he held her gingerly as Aunt Raella shooed him out of the sun and into the coolness of the front hall. He sat at the kitchen table and stared down at his little girl, cradling her against him. He and Farrah had never decided on a name. He wondered what Farrah called her—maybe named after her mother? He glanced up, and found an unfamiliar woman watching him. She was clearly of desert stock like himself, with black hair and brown eyes, maybe a little older and jiggling a toddler on her hip. She smiled at him and the baby. Kadar blinked, a little taken aback. He’d never thought of Farrah getting a wet nurse for their child. Northern women tended their own babies and seemed to look askance at the desert tradition of abdas. He hadn’t expected Farrah to be comfortable with the practice. Kadar sighed. There were so many things he and Farrah never got to decide before he’d rushed off with Sulis. At least it seemed that his aunt and uncle had understood better than Kadar did what Farrah would need—they would have been the ones to find Dana and hire her since Farrah was a Forsaken, and Forsaken could not employ workers outside their own caste. Kadar looked back down into the blue eyes his daughter inherited from Farrah. Datura was a moonflower that grew in the more fertile parts of Shpeth and twined around poles and trees. A tenacious, strong vine that flexed with the wind without breaking, it thrived in the harshest soils and bloomed bright with the moon. It was the perfect name for a daughter of the desert. Kadar smiled and stroked Datura’s cheek gently with a finger, marveling at her tiny nose and rosebud mouth. She looked back at him and started making little smacking noises with her lips. She waved her tiny, chubby fingers in the air, curling them into fists. “That’s my cue then,” Dana said. She set the toddler she was holding down on a blanket in the center of the room and gathered Datura into her arms as Kadar gently held her out. The toddler sat up and shoved his fist in his mouth, staring at Kadar as Datura was whisked out the room. Kadar stared back, bemused. Aunt Raella and Uncle Tarik joined him as the family’s cook entered the room and plunked a cup of tash and a plate of meats in front of him. Kadar was silent a moment. “She doesn’t live here with the baby?” he asked. Uncle Tarik frowned and looked down at the table. Aunt Raella watched him a moment then looked directly at Kadar. Kadar stared down at his cup, his emotions swirling. Farrah had left their child. It was hard to believe. But he knew she despised soldiers and would want to exact revenge for her mother’s death. His aunt and uncle didn’t know Farrah was leader of the Forsaken movement, along with Kadar and Ashraf. “Is anyone going to help an old man out?” Uncle Aaron called from outside. Kadar hastily gulped the rest of his meat and cheese and went out to help carry in the family goods. He glanced at the doorway Dana had disappeared through, hearing a soft lullaby, and smiled as he went about his work. He had all the time in the world to spend with his little girl now. He would make sure his reunion with her mother was memorable as well.